Jonathan Rosa and Cornelius Crawford were arraigned overnight. A vigil honoring the victims is planned for Tuesday evening. TIOGA (WPVI) -- The two men charged in Friday's carjacking and crash in Tioga that left three children dead and their mother critically injured were arraigned early Tuesday morning. Jonathan Rosa, 19, and Cornelius Crawford, 22, are charged with 3 counts of murder and related offenses in the deaths of the three children. They are also charged with sexual assault, robbery, carjacking, and kidnapping in connection with the carjacking of a 45-year-old real estate agent that led up to the deadly crash. Meantime, another vigil for the victims is planned for Tuesday night at Germantown and West Allegheny, where the accident happened. Philadelphia City Council president Darryl Clarke, who visited the site Monday night, said the city owns part of the lot. A permanent memorial is being considered. 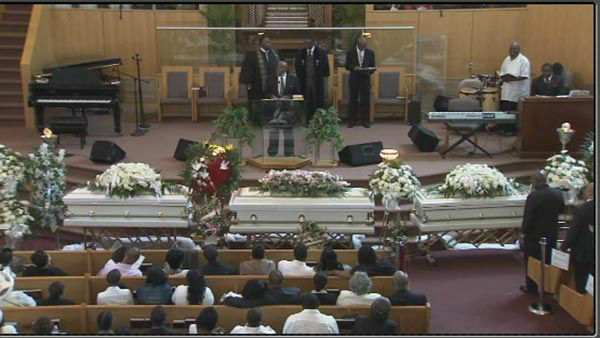 A funeral was held Monday for 15-year-old Keiearra Williams, 9-year-old Joseph Reed and 7-year-old Terrence Moore. Rosa and Crawford were taken into custody by police on Sunday after an intensive manhunt. Philadelphia Police Captain James Clark told the media Monday, "This is one of the saddest and most tragic incidents that [investigators] ran across, and as a result of that, everyone worked very hard for the last three days - night in and night out. No one wanted to go home, to make sure that we brought these individuals to justice, and we did that." The break in the case came when Rosa, his mother and a minister came forward to police. Rosa's attorney, Christopher Warren says his client broke down crying when he saw pictures of the three children killed. "I just left him. He is in shambles, and he literally cannot erase the image of that poor child coming over the hood of the car," Warren said. "It haunts him like you wouldn't believe." Warren continued, "And he and his mother sat down and decided that the best thing that they can do is try and cooperate to atone for what happened Friday afternoon. So, that's what he's doing." Hours after Rosa turned himself in and began cooperating, Crawford was picked up by police and federal marshals, who raided a residence at 6th and Cambria in the general vicinity of where the white SUV was carjacked at gunpoint. Neighbors say Crawford is homeless and lives in a shed on that North 6th Street property. Crawford and Rosa had apparently only known each other for a week. Capt. James Clark said Crawford was "very well known to police," but Rosa was not. He had one prior offense, a guilty plea for robbery in 2007. Investigators say Rosa's cell phone was recovered at the carjacking scene. They also say additional help from the community, including detailed descriptions of the suspects, helped solve the case. "I want to thank the public for all their assistance in bringing this case to a successful conclusion," said Police Commissioner Charles Ramsey. Deputy Mayor Everett Gilson said, "Thank you to that same community that stood up and did the right thing, and basically said we are not going to be able to do this. We're going to do whatever is necessary to help get these people off the streets. And with your help that has happened." A $110,000 reward was posted for information leading to the arrest and conviction of the two suspects, $10,000 of which was posted until noon Monday as incentive for a speedy arrest. So far, there has been no word if anyone is in line to receive the reward. Philadelphia District Attorney Seth Williams said at Monday's news conference that Philadelphia 76ers legend Charles Barkley contacted him and offered to pay for the funerals for the victims. Williams said he then helped Barkley get in contact with the family. The incident all began around 11:15 a.m. Friday at the intersection of Germantown Avenue and West Allegheny. A 45-year-old woman, a real estate agent who had just met with a client, was carjacked at gunpoint and forced into the back seat by two men, who took off. Police say the men sexually assaulted the woman as they drove at a high rate of speed - eventually crashing the vehicle at Germantown and West Allegheny. They crashed right where 34-year-old Keisha Williams and her children, 10-year-old Thomas Reed, 15-year-old Keiearra Williams and 7-year-old Terrence Moore, were helping 65-year-old Thelma Brown sell fruit to raise money for their parish, Eagles Wings Evangelistic Church at 17th and Tioga. The Toyota 4Runner SUV that was carjacked blew a tire as it was turning at a high rate of speed. The SUV crashed through the little fruit stand, scattering the victims' bodies across the community garden before crashing into a grove of trees on the far end. "The first thing I noticed was the kids, children, on the ground. Nobody was moving," said witness Renee Charleston. Investigators say the suspects then fled the scene on foot. City Council President Darrell Clarke was out at the scene of the accident Monday afternoon. He says the city owns part of the lot where the deadly crash happened and they're thinking about a permanent memorial. Two men may be behind bars for the tragedy, but the fact remains that three children are gone. On Tuesday their family will hold another vigil at 6:00 p.m.
Police are quick to say they received a lot of help making these arrests from the public. Philadelphia has a standing $20,000 reward offer in unsolved homicides. If you have information that could help Philadelphia police solve a crime, you can submit a tip by calling 215-686-TIPS or text to P-P-D-TIP. You can email photos or video to tips@phillypolice.com or reach them via private message on Facebook or Twitter.